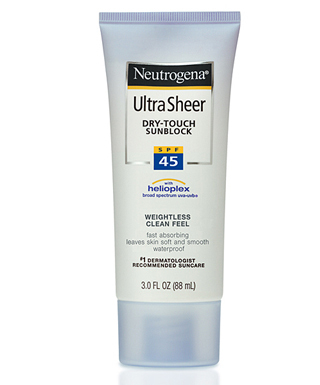 I had used a number of sunscreens earlier,before discovering this.All they did was to make my skin greasy and red(Apart from the higher end ones from Dior,Chanel & Givenchy).When I first used Neutrogena Ultra Sheer Dry-Touch Sunblock SPF 45 for the first time,I realised that sunblocks can come with non-greasy textures as well. According to Neutrogena,"This dermatologist-tested formula uses Avobenzone to provide advanced protection against damaging UVA and UVB rays, along with Dry-Touch technology for an ultra-light, non-shiny finish. Fast-absorbing and waterproof, this non-oily formula is enriched with anti-oxidants to help skin fight the harm caused by environmental damage. This product features Helioplex®, a breadth of stabilized sunscreen technologies that delivers superior protection from the sun." True to their claim,it is waterproof and sweatproof.When I used it in the extremely hot climate of India during May-June,it never wore off.Neither does it give any extra glow on the face,like some of the high-end sunblocks I had used.It just melts into the skin and makes it soft and fit for a day out. Even makeup also glides smoothly over it,without any primer.I use a Powder Compact foundation on top and it sets so fine.I cant think of using any other regular sunblock now,except when I dont require the extra glow. Learn more about Helioplex® . Hi! Thank you for following! I like your blog very much ;o). See you soon. Xoxo V.V. I love Neutrogena products. They work so well. seems lovely! !i should try it!!! Thank you very, very, very much for the sweet comment on my blog. I really appreciate it very much. It's good to see somebody appreciating your work when you have put so much effort into it. this is definitely one of my essentials too, I love how it's so lightweight compared to other suncreens.